Pomanders are small containers with perfume that spread from the orient towards Europe throughout the middle ages. The reason was a lack of hygiene in the cities. They were spherical containers with one or several compartments which contained musk. Preserved pomanders further have openings in the outside so that the scent could be smelled. 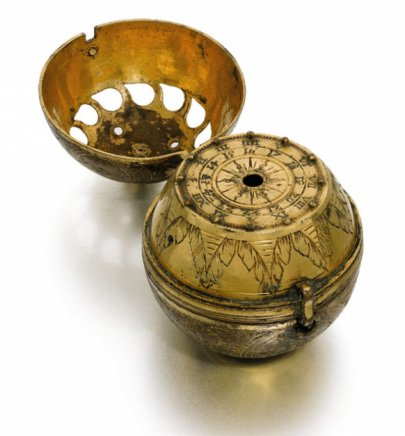 In the early 16th century, Peter Henlein of Nuremberg was ‚one of the first’ (according to a contemporary source) who built small watch movements into these pomanders. The design consisted of two small half-spheres, joined by a hinge. The upper half could be opened to reveal a second – slightly smaller – half-sphere underneath. The top of that inner sphere showed a dial. The dial had twelve touch-knobs – where all authentic pieces show the know at the ‚12’ as taller and pointy, so that it could be used to count the relevant hour from there in darkness. Inside the sphere is a little iron movement. This movement sometimes also has an alarm mechanism. These movements are rather rough and not polished. The filing traces and scratches have sometimes been mistaken as ‚signatures’ (e.g. N, P, H). The case of those timepieces with alarm has little feet to allow standing on a table. The case of the examples without alarm is flattened on the underside. The cases of all authentic watches of this type is made from gilt brass and shows vivid engravings or portraits and ornaments. Although it is known that Peter Henlein built pomander watches, no original watch is preserved that is signed by him or can reliably be ascribed to him. 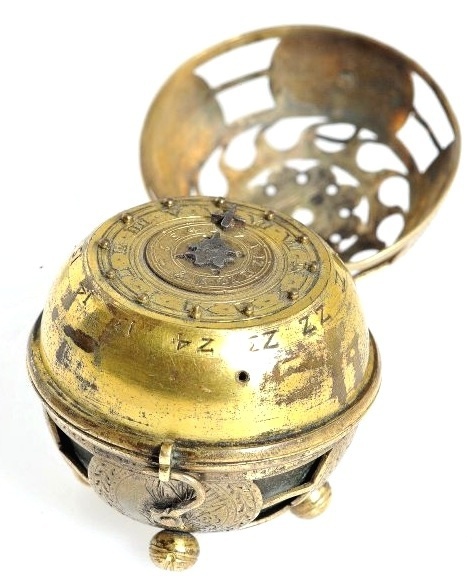 A fourth pomander watch was preserved in the Mathematisch-Physikalischen Salon in Dresden but mostly destroyed during World War II. A small fragment is preserved in Dresden. A second type of spherical watches should be distinguished from pomander watches. 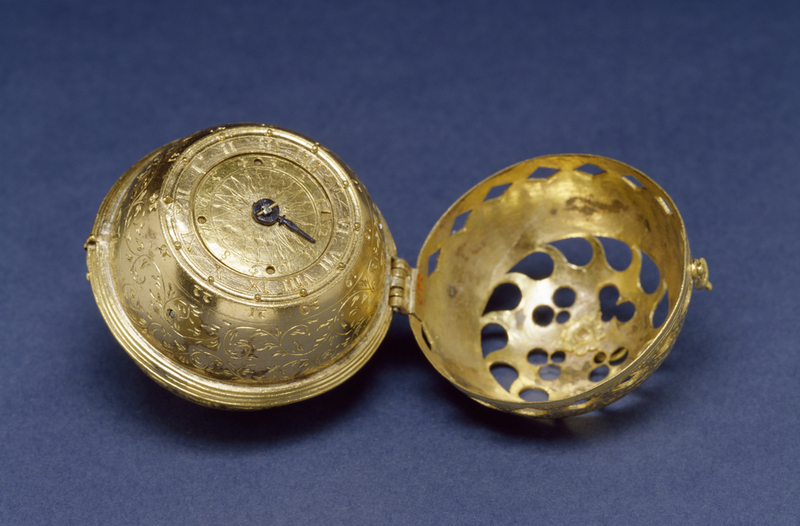 These spherical watches were mostly fashionable in France in the middle oft he 16th century (e.g. 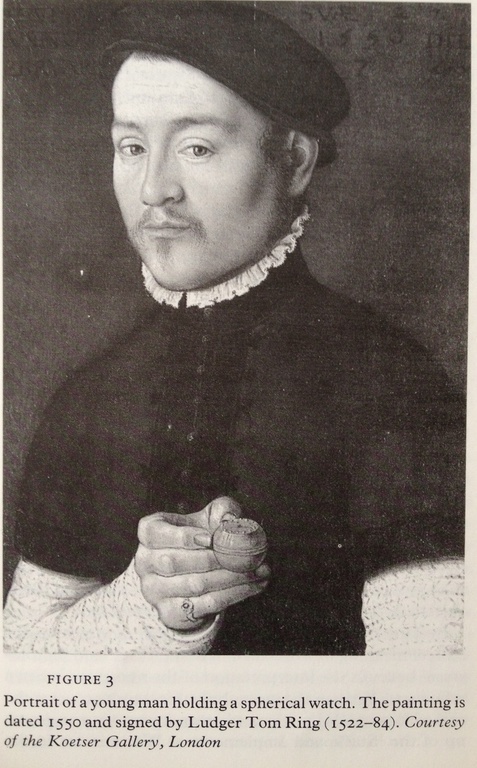 Jacques de la Garde, dated 1551). They were intended to be worn as watches, too – although some pieces of this shape were clocks to be suspended from the ceiling. The dial of these spherical watches was outside – usually on the underside. Those post-pomander-watches were made in Germany, too. The following pictures show two such examples from Germany.